VISITING ARTIST—Can a man with a dream win the heart of the world's most powerful woman? Can love conquer all? COURTING CONDI is a devilishly funny musical-mock-docu-tragi-comedy—and as clever a film as you are ever likely to see. 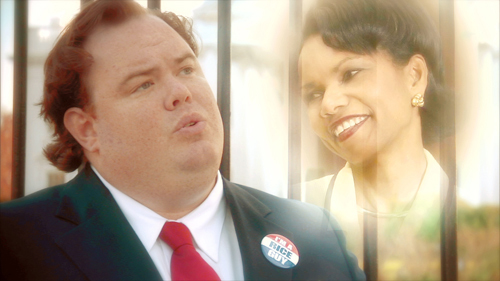 Part BORAT, part FAHRENHEIT 9/11, and part MAMMA MIA, COURTING CONDI follows a love-struck soul's hilarious, emotionally engaging, and ultimately shocking quest to woo Secretary of State Condoleezza Rice. A spin on the Rapunzel fairy tale, Doggart’s unique romance/biography follows Devin Ratray, a portly 30-year-old musician, actor (famed as Buzz in HOME ALONE), and besotted admirer of 54-year-old Condi, as he prepares to meet her and claim her heart, soul, and stretch limo. But as Devin travels the country tracking her real-life roots, disillusionment waits in store for him. COURTING CONDI reveals the perplexing life story of one of our era's most inspiring, enigmatic, and controversial figures, enlisting an array of voices that will surprise, delight, and dismay you. “Witty, poetic, and informative. It’s amazing how much of Rice’s real life story is in the film.”—The New York Times. Sebastian Doggart will introduce the film Friday evening. From an ancient right of passage to a scorned transgression of the Ten Commandments, the tattoo has played numerous cultural and sociological roles throughout history. Evans' controversial documentary enlists sociologists, psychologists, and historians, along with a bevy of celebrities—among them David Carradine, Brad Dourif, and Greg Grunberg—to offer diverse perspectives on the stigma of the tattoo and its contemporary evolution. Presented in conjunction with the Portland Art Museum's MARKING PORTLAND: THE ART OF TATTOO, June 20–September 6. 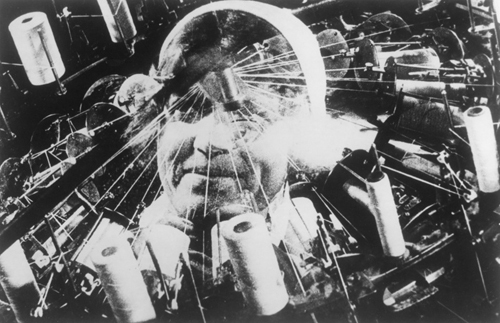 Demonstrating his famed "kino-eye" theory, which endows the movie camera with the flexibility of the human eye, Vertov’s groundbreaking film retains the infectious exuberance that has made it an enduring classic. Part documentary—it is a portrait of a city (a composit of Moscow and Odessa) and its inhabitants, and a veiled political rumination on the state of the Soviet Union—it is also a witty compendium of extravagant camera techniques and editing tricks, forever commenting on itself and on our own regard. Appropriately, the avant-garde camera hero takes a bow at the end. Tonight, Boston’s Alloy Orchestra will accompany the film with their own live score. "The three-man ensemble's original score is a syncopated noise symphony that, at once homemade and high-tech, mixes radio transmissions, birdcalls, and police sirens, and surpasses all expectations in its sensitivity to Vertov's wit, eccentricity, and sense of rhythm. . .A once-in-a-lifetime experience."—J. Hoberman, Village Voice. The Alloy Orchestra members are Terry Donahue (junk percussion, accordion, musical saw, banjo), Roger Miller (synthesizer, percussion), and Ken Winokur (director, junk percussion, clarinet). Special Admission: $15 general; $12 members. Advance tickets for the full evening are available from CMNW: $22-$30 general; $10 students. Tickets for the 8 p.m. film only, if available, will be sold at the door: $8 general; $7 members. 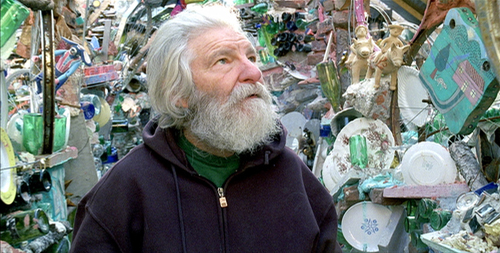 Winner of the Audience Award at the South by Southwest Film Festival and a PIFF favorite this year, IN A DREAM takes us on an intimate, visceral journey into the world of artist Isaiah Zagar, the director's father, who over the course of four decades has covered more than 50,000 square feet of Philadelphia with stunning mosaic murals. Beyond exploring the artist's astounding life's work, the film chronicles his tumultuous relationship with his wife and the implosion of their marriage. As it turns from a character study into an incredibly personal, stirring drama, IN A DREAM explores both the power of art and the mysteries of the soul. “Bursting with vivid home movies and loving appreciations of Isaiah’s artwork—frenzied drawings and monumental mosaics in tile and mirror—IN A DREAM abounds in visual pleasure.”—New York Times. When we pass on, what becomes of the objects we have cherished during our lifetimes? In this Chekhovian drama about loss and change, Assayas subtly explores the fractious encounter of three adult siblings returning to their childhood home to dispose of their deceased mother's possessions. Left to come to terms with themselves and their differences, Adrienne (Juliette Binoche), a successful New York designer; Frederic (Charles Berling), an economist and university professor in Paris; and Jeremie (Jeremie Renier), a dynamic businessman in China, confront the end of childhood, shared memories, and their unique visions of the future. “A warm, wise drama about the tensions and mysteries of family life…beautifully performed, intelligently written, and fluently directed.” —Time Out, London. Screening open to Silver Screen Club members only; no ticket purchases or reservations necessary. Membership cards must be shown at the door. 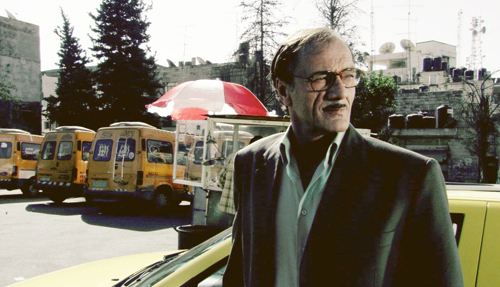 Masharawi (TICKET TO JERUSALEM) sets his new film in his chaotic hometown of Ramallah. LAILA'S BIRTHDAY tells the story of an experienced but unemployed Palestinian judge-turned-taxi driver who must navigate corruption, hassles, constantly changing political winds, and pervasive Israeli checkpoints in and around the city. Merely attempting to arrange for a birthday cake and gift for his young daughter, he finds himself faced with an epic task. Masharawi provides a lively and revealing portrait of both a city and a decent man at the breaking point. “A brilliant fusion of road movie, family drama, cinema of the absurd, and sociological exposé.”—Screen International. 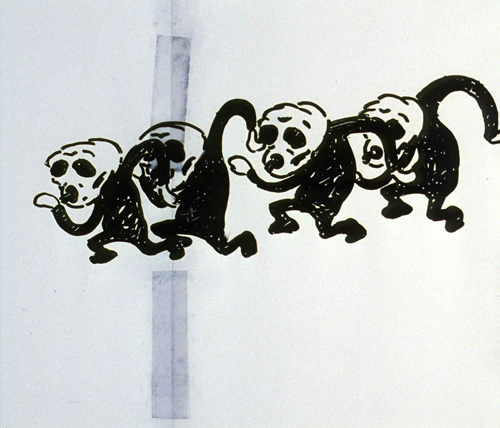 A pioneer in the field, British animator Paul Vester has been primarily concerned with the language of animation. Vester combines different media and techniques to create personal work that is both eclectic and referential, while producing commercial projects of astonishing range. He is the co-director of the experimental animation program at the California Institute of the Arts, and was a recipient of the Guggenheim Fellowship, among many other awards and honors. Tonight he will screen and discuss some of his key films, including SUNBEAM (1980), PICNIC (1987), ABDUCTEES (1995), and IN THE WOODS (2008), as well as a wide-ranging selection of his television commercials and work produced for television programs. Presented in conjunction with the Pacific Northwest College of Art’s Boundary Crossings: An Institute in Contemporary Animated Arts. Cartoonist Nina Paley's inspired tale of love gone wrong cheekily mixes different styles of animation into a jazzy, eye-popping epic of flying monkeys, many-headed demons, and love-weary women. Paley pairs the story of her own marital breakup with the legend of the Goddess Sita, whose unceremonious jilting is recounted in the Indian epic The Ramayana. Paley’s Busby Berkeley-like numbers, punctuated by the Betty Boop stylings of 1920s chanteuse Annette Hansha, earned her film the Best Feature prize at the Annecy International Animation Festival. Presented in conjunction with PNCA’S Boundary Crossings: An Institute in Contemporary Animated Arts. 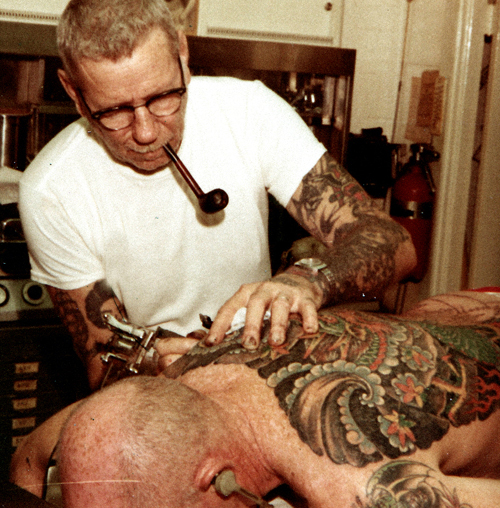 Your ticket to the Thursday screening will get you free admission to the Thursday, July 23 Top Down screening at 9 p.m.
One of the foremost tattoo artists of all time, Norman “Sailor Jerry” Collins was an uncompromising pioneer in what has come to be known as modern day tattooing. Heavily influenced by Asian tattoo aesthetics and his wartime experiences in Hawaii, Sailor Jerry’s inexorable personality is every bit as unique as his artwork. Exploring the roots of American tattooing and featuring conversations with famous tattoo artists such as Don Ed Henry and Mike Malone who knew him best, HORI SMOKU SAILOR JERRY constructs an immensely entertaining portrait of a singular artist and his work. "Reason #7 for not getting a tattoo: People will know you are running your own life instead of listening to them." —Sailor Jerry Collins. Intertwining a series of seemingly unrelated events surrounding a wide cast of characters, YOU, THE LIVING portrays human flailing toward self-fulfillment in a surreal world. 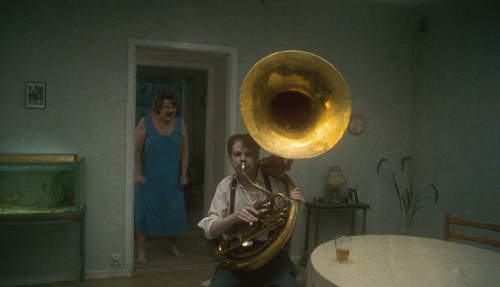 As in his critically acclaimed SONGS FROM THE SECOND FLOOR, Andersson uses a sardonic, starkly formalistic technique, creating a series of 50 visually ingenious, cleverly choreographed, and frequently uproarious vignettes of modern life. "What you might get if Jacques Tati's Monsieur Hulot wandered into the moody existential vistas of Andrei Tarkovsky! "—Sight and Sound. "A strong contender for the accolade of funniest film in the Festival. "—London Film Festival. Last year's Swedish submission for the Best Foreign Language Film Oscar. The prisoners of the Stalinist Gulag, or "Zone," as it was called, developed a complex social structure that incorporated highly symbolic tattooing as a mark of rank. Sailing ships, stars, angels, and executioners—THE MARK OF CAIN chronicles the vanishing language of Russian Criminal Tattoos. Filmed in some of Russia’s most notorious prisons, including the fabled White Swan, THE MARK OF CAIN traces the animus of the flowers of this carnal art by way of the brutality of its origins—the penitentiary and the criminal environment. Incisive interviews with prisoners, guards, and criminologists reveal the secret language of the Zone and the Code of Thieves of the vory v zakone. "A new zenith of body horror in the cinema, the resolutely unclassifiable TAXIDERMIA provocatively charts three generations of men in a profoundly peculiar family: hair-lipped, self-abusing grandfather Vendel begets 1950s Olympic speed-eater Kálmán, who sires anti-social, fearfully imaginative taxidermist Lajos. Moving from an explicit exercise in central European miserableism to grotesque comedy to David Cronenberg's worst nightmare, each segment mixes shock value with a macabre, faintly sentimental mystery—just what one would expect from the director of festival favorite HUKKLE. "—Sydney Film Festival. “Three men; three generations of Hungarian history; three grotesque and life-defining pursuits: sexual perversity; power-eating; taxidermy. Welcome to what is surely the most outrageous and stomach-churning film of the entire (PIFF 2007) festival! "—Shawn Levy, The Oregonian. "Five years after the guerrilla fantasies of ICE, Kramer and John Douglas turned the cameras on themselves, their friends, and characters like them. Some fifty interconnected characters play both their scripted roles and themselves, revealing more by what they do than by the improvised lines they are speaking. Ranging from filmmaker to potter, organic farmer to draft resister, acupuncturist to isolated political organizer, these characters retain an incredible social mobility. They pass easily in and out of the bourgeois world, accepting poverty and working-class life only as long as it suits them. It's amazingly schizophrenic, fascinating to watch, and utterly true. "—Thomas Brom. “I have the sense that any attempt to grasp the essence of the '60s will have to pass through MILESTONES, as sad and compassionate a movie as I have ever seen.”—A.O. Scott, New York Times.